The sensors connect via Bluetooth to a smartphone, tablet or computer. Once the drum kit is defined by the user, the sensors allow you to play the drum anywhere and on any surface. 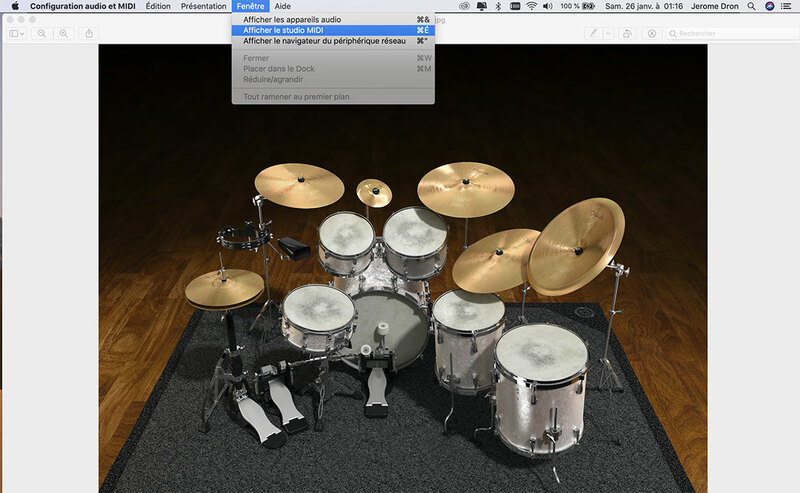 You can emulate drum sounds from any application or DAW (Digital audio workstation) software that accepts MIDI via Bluetooth such as Cubase, Logic Pro, etc. 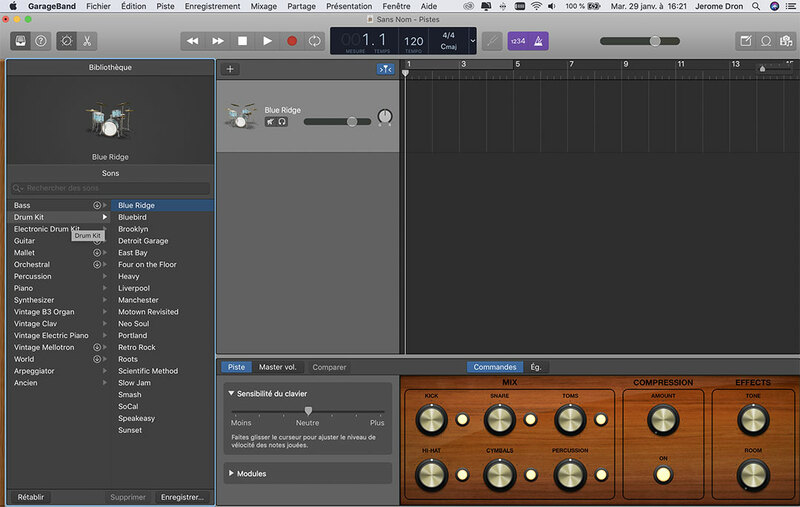 In this tutorial, we will show you how to connect your Senstroke sensors to Garageband on Mac OS. 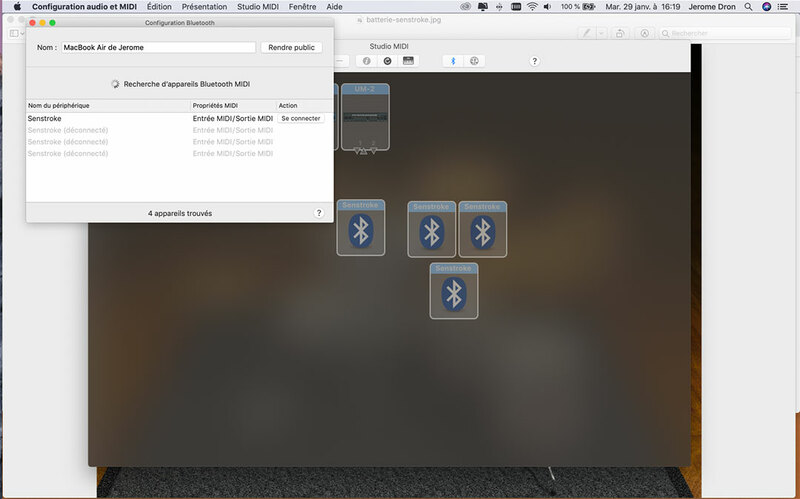 If you prefer a video version of this tutorial, feel free to watch our video on How to connect Senstroke sensors to Garage Band Mac Os. If you want to connect your Senstroke sensors to the Iphone or Ipad version of Garageband, we invite you to read this turorial on How to use Senstroke sensors with Garageband on IOS. We refer you to this page, which details all the steps to follow in order to configure Senstroke sensors. Once the sensors have been configured and the play area defined, you can exit and close the Senstroke application completely. Go to your Mac. In Spotlight, enter “MIDI”. Then click on “Audio and MIDI configuration” to go to the MIDI studio. If the MIDI studio does not appear, click on “window”, then on “display MIDI studio”. Once in the MIDI studio, click on the Bluetooth icon at the top of your screen. The “Search for Bluetooth MIDI devices” window then appears. Turn on the Senstroke sensors, they should appear in the visible list of Bluetooth devices. 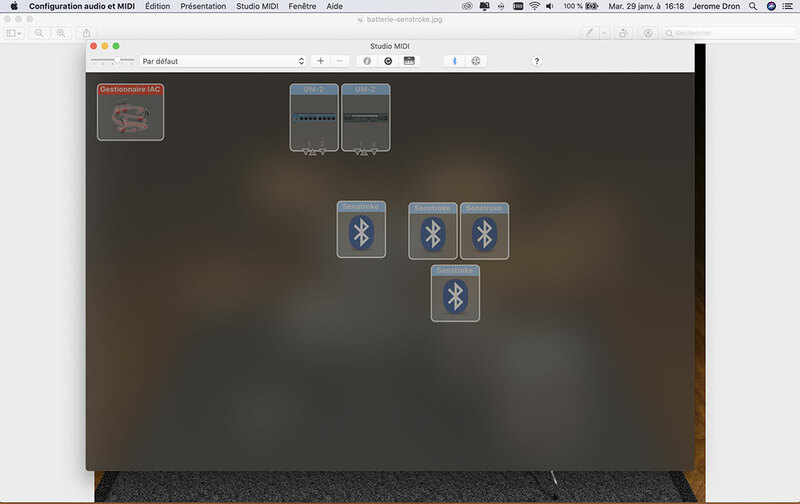 Then click on “Connect” to connect each sensor to your MAC. Once the sensors are connected, the LED indicator returns to green. They must appear in the MIDI studio. The pairing was then successful, we can now launch Garageband. Once Garageband is launched, click on “New project”, then on “Empty project” to start a new project. You are then asked to choose a track type from Software Instrument, Audio or Drummer. 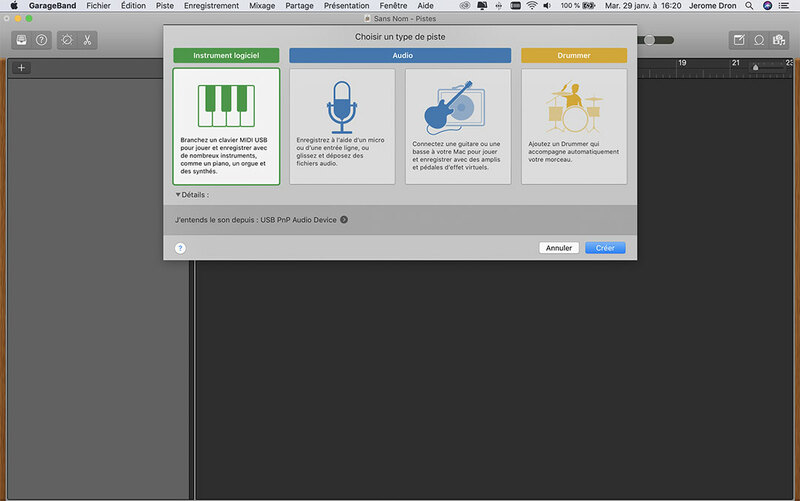 Select “Software instrument”: this feature will allow you to connect Senstroke sensors to Garageband. You can then create the track. The default instrument loaded on the track is a piano. Then go to the “Library” window on the left of the screen. Select “Drum Kit” and choose the kit of your choice. The sensor signals are now read in Garageband. 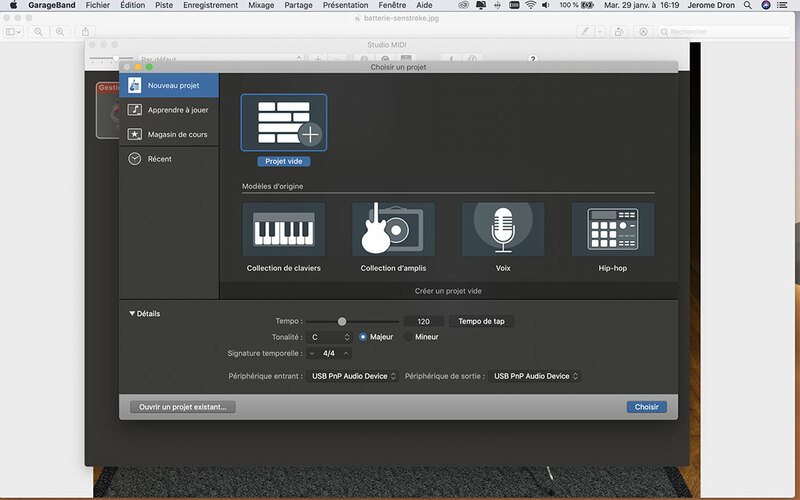 You now have the possibility to use all the features of Garageband on Mac OS with Senstroke sensors. For example, you can easily record yourself playing, modify the written MIDI track, accompany other instruments, etc. The possibilities are numerous ! To disconnect the sensors from Garageband, return to the Bluetooth MIDI device search interface and click on “disconnect”. You can also turn off the sensors by pressing and holding the sensor button. Feel free to react on our Redison Forum and follow us on Facebook, Twitter and Instagram. We will be happy to answer any questions you may have. We hope that this Senstroke tutorial has been useful to you. You can also find all our tutorials to connect Senstroke sensors to a DAW software ! And don’t forget, keep on drumming !